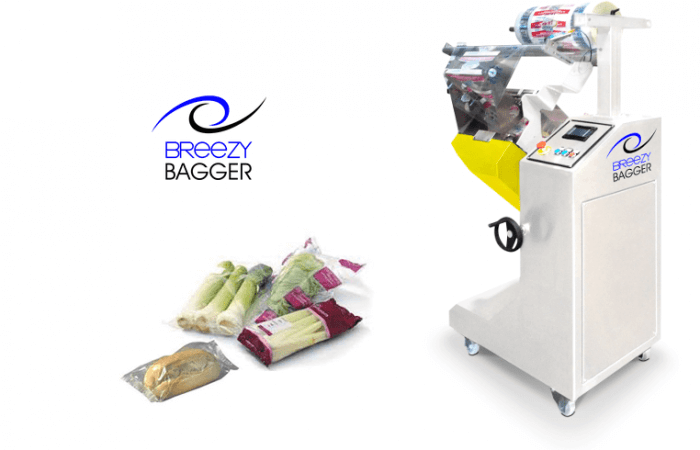 The Breezy Bagger is specifically designed to combine horizontal wrapping and vertical bagging in one state of the art new compact machine. With no comparison to anything on the market to date, The Breezy offers extreme versatility with its unique pivoting feature that can be used for many applications. In the vertical position perfect for automatic bagging and product loading. In the horizontal position for products requiring over wrapping including trays and containers. Included is a unique length detection sensor and operational logic that adjusts to the length of product each cycle and makes the bag according to the length of product. The benefit to the user is cost saving on materials on products that vary in length as well as random filling of product where bulk density changes. This compact automatic bagging machine will immediately provide a return on investment as it will increase productivity, reduce product giveaway and provide more consistency than manual hand labour.